In 2011, I coordinated to bring eleven Tibetan Buddhist monks to East Carolina University Campus in Greenville, NC. They performed a Sacred Dance Sacred Music for World Peace at Wright Auditorium. 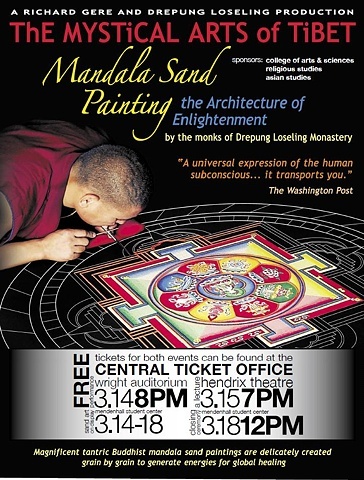 Then they resided in Greenville, for five days as they constructed a beautiful Sand Mandala in the ECU Student Center. This was a personal achievement for myself, because I was in graduate school and about a week away from the opening of my Thesis Exhibition. I had been working on bringing the group for about year, raising funds from various departments at ECU, such as Asian Studies, Religious Studies, and Student Activities. Special Thanks to Dr. Derek Maher for bringing me to India, teaching me, and being super positive all the time. POSTER: Tibetan Buddhist monks visited from Drepung Loseling Monastery.